Writing exercise: start with an object from nature - a leaf, nut, burl, clump of moss. Take a long, close look. Now "wildwrite" for ten minutes without stopping. This emerged from my "wildwrite" on an acorn. Here is a cap and a chin and almost a face. The chin has age spots. But the cap is youthful, a beanie. And the face is eager and blank like an Amish doll, sacred and hopeful. Wisps of dandelion cling to cap and chin, and the object trembles with the motion of the table which moves under my pen, my hand. The expressions of this face are an image, a dream, something unreal. They are unwritten stories. I am so like this acorn wobbling on the table. Smooth and young but flawed, scarred with being. I see my unwritten books. I see growth that hushes, shushes, and whispers, sidling down through the leaves, the speckled shadows. 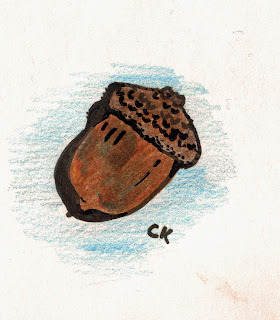 An acorn on the walk. Walk I must; keep on.